Many young people are interested in a career in international development. Thousands volunteer in development organisations across the country, and development studies and international relations are some of the most popular undergraduate university courses in Australia. The appeal of a career that combines doing good with international travel is undeniable. But the popularity of the field also makes it competitive, and it can be tough for students to know where to start. 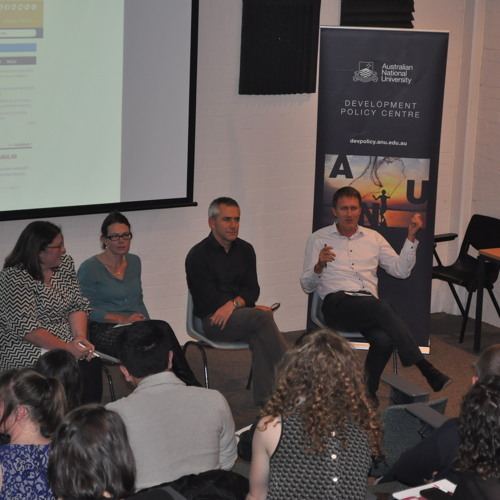 This public seminar, hosted by the Development Policy Centre and the ANU Aid and Development Learning Community, gave students the chance to hear from those working in the development sector. Our panelists spoke about their own careers in the aid program, NGOs and the private sector. Students also heard about some of the entry points to a development career, such as volunteering, and had the chance to ask questions. Speakers: Jacqui De Lacy, Abt JTA; Chris Adams, ACFID; Alwyn Chilver, GRM International; Ashlee Betteridge, Development Policy Centre, Crawford School.